This could even impact travel to and from Northern Ireland with pets in the event of a hard-border. Frodo Baggins was the first animal to arrive in Britain under the pet passport scheme in 2000. IRISH PET OWNERS have been warned to be mindful of potential changes for travelling with pets in the event of a no-deal Brexit situation. This week the British government outlined the worst-case scenario for pet owners in the event the UK leaves the EU without a deal in place in March next year. 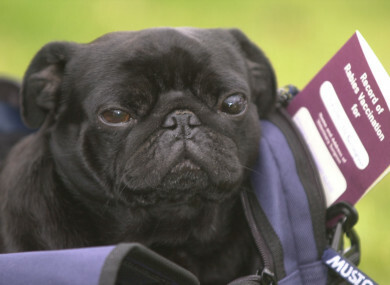 Currently, people can travel within the EU with their pets using the pet passport scheme. To get one of these passports, pets are required to have certain vaccinations and if they have this document, they do not need to be quarantined before travel or on re-entering their home country. Should the UK become an unlisted third country, pet owners intending to travel with their pet from the UK to EU countries would need to discuss preparations for their pet’s travel with an Official Veterinarian (OV) at least four months in advance of the date they wish to travel. This means pet owners intending to travel to the EU on 30 March 2019 would need to discuss requirements with their vet before the end of November 2018. Gillian Bird of the DPCSA said the charity has been closely watching developments in this area. “It’s all up in the air – as is much of the other stuff around this. Pet owners need to be aware of this and keep an eye on dates if they are planning to travel to the UK,” she said. She said people may not have an issue travelling into the UK if they have a European Union pet passport, but on returning from what may then be a non-EU passport country, they may run into trouble in Ireland. “We just don’t know what will happen,” she said. “Coming from a non-pet passport country like China for example, you have to have documents and you can travel with them if you have paperwork and the vaccinations but the animal may still have to spend a few weeks in quarantine. It’s the same with America – because it is not a rabies-free country they would have to go through quarantine here. Now people wouldn’t really take their pets on holidays to America. The period in quarantine could be more than three months if owners have travelled to the UK without a pet passport – and the DSPCA has seen examples of people attempting to do this at Dublin Port. They could make it to Britain without any issue, but on return they may face problems. And if negotiations around the Northern Ireland border do not end in a resolution that prevents a hard border, this could even impact on travel between there and the Republic. Currently, pet owners do not even need a pet passport for this travel. A spokesperson for the Department of Agriculture, Food and the Marine said “the UK has not yet announced what, if any, requirements it may impose on pet animals travelling from Ireland to the UK after it leaves the EU”. Email “No-deal Brexit could mean weeks of quarantine for Irish pets travelling with owners to UK ”. Feedback on “No-deal Brexit could mean weeks of quarantine for Irish pets travelling with owners to UK ”.